Are you concerned because you spent nine months excitedly waiting for your bundle of joy to arrive but now you don’t feel the way you thought you would? Do you struggle to connect with your baby? Do you worry about not being the mom you thought you would be? Don’t worry, mommy. What you are feeling is perfectly normal. While you may only have a case of the “baby blues,” postpartum depression is also a possibility. It’s a common disorder, affecting 1 in 7 new mothers (source). We’re here to break down the differences between the two and walk you through the “ins and outs” of postpartum depression. This includes symptoms, ways to manage the condition, and more. We’re in this together, so let’s get started. 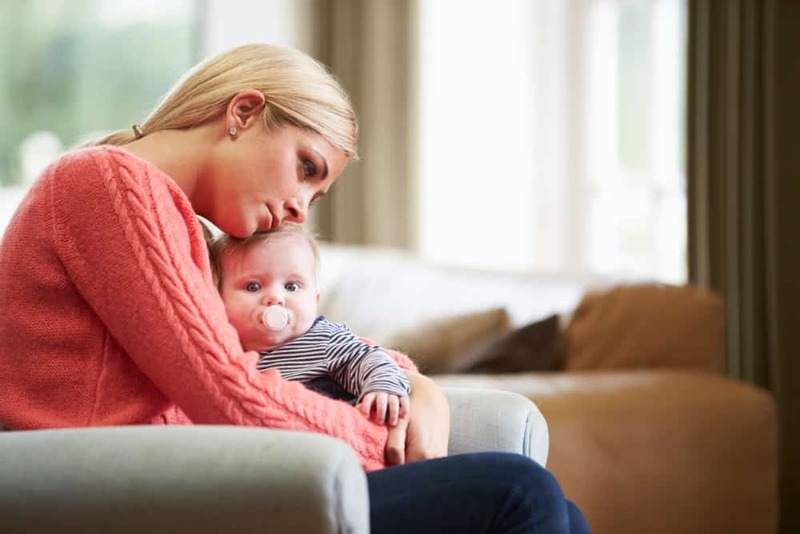 Learn more about how to understand, cope with, and recover from <a href='https://momlovesbest.com/postpartum-depression'>postpartum depression</a> on Mom Loves Best. Postpartum OCD (obsessive compulsive disorder): Characterized by an obsessive worry and a constant need to check on your baby. It can include getting up every few minutes to make sure your baby is still breathing throughout the day and night. Studies have shown that up to 57 percent of women with postpartum depression also have postpartum OCD (source). The following factors may mean you have a predisposition to postpartum depression. They include a few pre-existing circumstances but also some that may come with pregnancy. Age: Being a teenage mother (13–19 years) increases your risk of suffering from postpartum depression (source). The risk decreases with age. Glucose levels: Women who had higher blood glucose levels during pregnancy have more chance of suffering from PPD. Oxytocin during pregnancy: Oxytocin helps regulate our emotions, and women with high levels of oxytocin mid-pregnancy may be prone. Estrogen levels: Fluctuating estrogen levels can also be a risk factor. Estrogen is a hormone that is necessary for reproductive health. Smoking: Smoking cigarettes increases the risk of postpartum depression. Low vitamin B6: This affects serotonin production, which increases the risk of developing depressive symptoms post-birth. Here, we cover social aspects and lifestyle factors which may lead to an increased risk. However, being of a particular socioeconomic status or having a particular lifestyle does not mean you will definitely suffer from postpartum depression. The number of children: It has been found that women with more than two children are at a higher risk of developing postpartum depression (source). Economic stability: Mothers with an unreliable source of income are at risk. Family support: One of the most important factors, a new mother who doesn’t have sufficient support from a spouse or others may be susceptible. Domestic abuse: Victims of sexual assault and domestic violence are at risk. Diet:A diet lacking in fruits, vegetables, or legumes increases the risk. Diets too high in protein can lower serotonin levels, which is another factor. Sleep: While all new mothers suffer from a lack of sleep, severe sleep deprivation increases the risk. This means going several days without sleeping more than a few minutes at a time. Trauma: A new mother who experienced a traumatic event during pregnancy, like the death of a family member, has an increased risk. Alcohol or drug abuse: Using drugs or alcohol on a daily basis is not recommended. The health of your baby: Mothers of babies who are sick, suffering from genetic disorders, or are otherwise not completely healthy, are at higher risk. Mothers who don’t breastfeed their newborns may be at increased risk of postpartum depression. This also includes mothers who struggle to begin breastfeeding, or have difficulty maintaining the needed milk supply. Every pregnancy is unique, just like each mother’s birth plan. However, there are things that can happen during pregnancy and delivery that can increase your risk of developing postpartum depression. High-risk pregnancy: Complications during pregnancy, such as hospitalizations or extended bed rest, can play a part in developing PPD. Labor and delivery complications: This includes umbilical cord prolapse, NICU stay, unplanned cesarean section, and infertility treatments. Low birth weight: Specifically with babies that weigh 3 pounds or less. Birth plan: When the delivery doesn’t match the expectations, the risk can increase. This is especially true when the mother was hoping for a vaginal childbirth and instead has an emergency c-section. Your personal and family health history can contribute to postpartum depression. Insomnia: Having insomnia in your family history can lead to a higher risk. Clinical depression: A previous history of depression could indicate a higher chance of postpartum. Other mental health conditions: If other mood disorders run in your family, this can increase your risk of developing depression after giving birth. Women who developed gestational diabetes during the course of pregnancy should take extra precautions to avoid postpartum depression after birth (source). Women with PPD may have an undiagnosed thyroid disorder. Depression may be a reversible symptom of thyroid disease (source). If depression symptoms persist, it may make sense to get a thyroid panel drawn. You can discuss postpartum depression with your doctor at any time. Since you’re reading this article, you probably have a few concerns. Go ahead and reach out! That way you can both be on the lookout for any of the concerning postpartum depression symptoms after you give birth. Plus, your doctor can give you any reading material he or she deems important. If you have already given birth, there will be a period of adjustment for your body and your emotional well being. As we mentioned, it’s possible you will suffer from a bit of the baby blues as well. If you’re feeling down, with no improvement, for two weeks or more, you are ready for a discussion about postpartum depression. If you’re having any thoughts about harming your baby, or you’re having suicidal thoughts, you should seek help immediately. Do not ignore it or attempt to wait it out. There is no laboratory test that can diagnose postpartum depression, although your doctor may do a blood panel to rule out other underlying issues. Generally, the diagnosis will include an in-depth discussion about how you are feeling, detailing your symptoms. Your overall mental health will be evaluated to help distinguish your postpartum symptoms from the baby blues and other conditions. The most important thing for you to do throughout the process is be forthcoming. It may seem like the questions are too personal, or you feel embarrassed answering them. However, keep in mind that postpartum depression is a common issue for new moms and the more honest you are, the better care you’re going to receive. Assess the risks: Know your personal risk factors, and make your doctor aware of them. It’s especially important to mention a history of depression, especially any suicidal thoughts. Educate yourself: Learn everything you can about postpartum depression while you are pregnant (before it has a chance to become an issue). Make a plan: Speak with your doctor, your spouse, and your family support system about your risk factors. Make a plan for how you will cope if you do find yourself with this condition after birth. Speak to a lactation consultant: If you are planning to breastfeed, have a chat with a lactation consultant or nurse for helpful advice and information. Sleep: Get as much sleep as you possibly can while pregnant. Before the baby comes, you can build a schedule with your spouse and other caregivers that will allow you to get the rest you need after birth (source). Speak up during labor and delivery: Listen up, queen. Don’t be afraid to tell everyone what you need. It’s important that you’re as comfortable as you can be, and — if you aren’t — let your nurse or physician know what you need. What Is A Doula & Do I Need One? Eat a balanced diet: A well-balanced diet rich in legumes, fruits, and vegetables will provide a hefty amount of the nutrients you need for recovery from birth and care for your child. Exercise: Not only is exercise good for your overall health, but it is also one of the key factors in reducing your risk (source). Even if you can only squeeze 10 to 15 minutes of moderate movement into your day, it will make you feel better about yourself and your body. Moderate your expectations: Don’t expect perfection from yourself or your mothering skills. Make sure your expectations are realistic, and even then, when you fall short, give yourself a break. You wouldn’t be overly critical to someone else, so don’t do it to yourself! Use your support system: Your body is healing, and you are dealing with the fact you have a tiny human to keep fed, clothed, and loved. Whatever help your family and friends offer, take advantage of it. There is no shame. Take vitamin B: If your doctor approves, add a vitamin B complex to your daily supplement regimen (source). Check in with yourself: Take stock of how you’re coping and how you are feeling emotionally at least once per day. Remember to discuss any concerning changes that you notice with your doctor. Psychotherapy for postpartum depression can take on many forms. Your doctor may suggest you attend one-on-one sessions with a psychologist or psychiatrist who specializes in postpartum issues. Your therapist may even suggest that your spouse joins the counseling sessions. Postpartum depression can make your relationship with your spouse difficult to navigate, and it is often beneficial for everyone to be involved and on the same page. It’s also possible your doctor will suggest you attend group therapy sessions, where you can share your experiences with other mothers in a similar situation. These sessions are often led by a licensed counselor or psychologist. Support groups may also be suggested as a supplement to therapy. There are many places you can find support groups, including a variety of online communities. These may be especially helpful for new mothers who have limited support systems, as it allows you to interact with other mothers from the comfort of your own home. Your doctor may choose to add medication, in the form of antidepressants, to your treatment plan. Antidepressants help regulate the chemicals in the brain, and generally take effect after three to four weeks. There are several types and they all work in different ways (source). Monoamine oxidase inhibitors: Developed in the 1950s, “MAOIs” stop an enzyme in the brain from breaking down the monoamine which aids in mood regulation. The brands of MAOIs include Nardil, Parnate, and Emsam. This type is the least prescribed, due to possible life-threatening side effects. Tricyclics: Also developed in the 1950s, “TCIs” stop nerve cells from reabsorbing serotonin and norepinephrine, allowing them to be used by the brain. Brands include Elavil, Norpramin, and Pamelor, but they are not prescribed as often as some other antidepressants, again due to side effects. But they may be prescribed if you have another condition, like obsessive-compulsive disorder. Selective serotonin reuptake inhibitors (SSRIs): First developed in the 1970s, this type of antidepressant is currently the most commonly prescribed. It keeps the serotonin from being overly absorbed, allowing it to be used by the brain instead. The brands include Prozac, Celexa, and Paxil, and these tend to have fewer side effects, but you should be weaned off them slowly versus suddenly stopping. As a rule, SSRI medications are safest for breastfeeding (source). Serotonin and norepinephrine reuptake inhibitors: The first “SNRI” was approved in 1993. This increases the amount of serotonin and norepinephrine in the brain, and works best for people who are fatigued while depressed. Brands include Cymbalta, Effexor, and Pristiq. Atypical antidepressants: These medications work in unique ways by changing the levels of certain chemicals in the brain. The major brands include Wellbutrin, Nefazodone, and Remeron. Postpartum depression poses a unique treatment issue due to the fact that the patients are new mothers. Many of these mothers are breastfeeding their newborn babies. 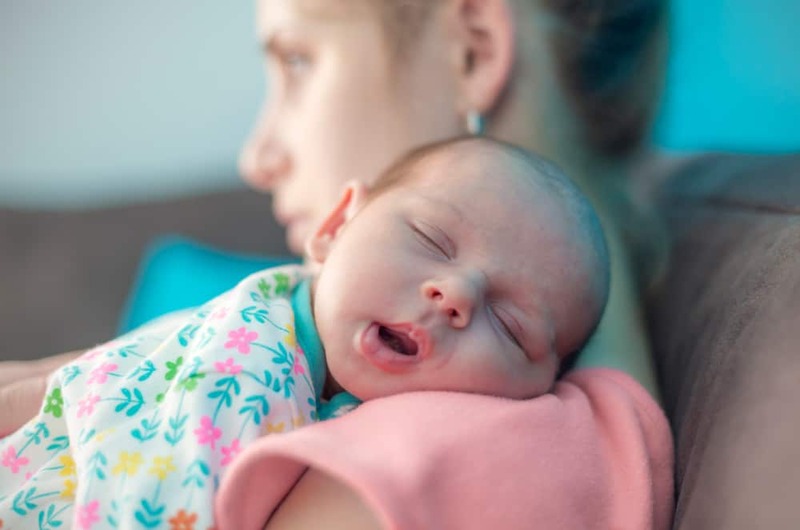 As a mother, you may be thinking you’re facing a dilemma: Treat the postpartum depression with medication and stop breastfeeding, or keep breastfeeding and skip the anti-depressants. However, that is not the case. New mothers shouldn’t worry about antidepressants being in breast milk. There is no evidence to support that it causes any ill effects for the baby (source). Women take the same antidepressants during pregnancy, and the risk of crossing the placenta is greater than the risk of being exposed to the medication through breast milk. Holistic and natural methods can be employed to help treat your postpartum depression, but it’s best to use them alongside the prescribed treatment from your physician. Before you try any new supplement or diet, you should always check with your doctor. This is especially true if you are breastfeeding. Yoga and meditation: Since we have already discussed the benefits of exercise in combating your side effects, yoga and meditation are alternatives. A study showed that 12-weeks of regular yoga significantly improved symptoms of mood disorders (source). The 12-week yoga intervention was associated with greater improvements in mood and anxiety than a metabolically matched walking exercise. Check with your doctor to make sure you are ready to start, especially if you had a c-section. Massage: There is healing power in touch. While there has been limited research in the practice, early results point to regular massage being beneficial as a way to improve symptoms. This is due to its relaxing and restorative nature. Notify your massage therapist ahead of time if you are breastfeeding. They may provide you with a special pillow to make lying on your stomach more comfortable. St. John’s Wort: A common herbal supplement, used as a natural treatment for depression. The results are mixed when it comes to the worthiness of using it, though (source). There is little published data on breastfeeding while taking St. John’s Wort. Aside from the above-mentioned supplemental treatments, there are other remedies and more natural alternatives to help combat the dreaded symptoms and side effects. We recommend checking in with your local apothecary shop, or consulting a homeopathic doctor for support. Don’t let anyone tell you your symptoms are fake, or that postpartum depression isn’t a real condition. There are many hormonal changes that happen inside a woman’s body immediately after giving birth. As we now know, these changes can cause your mood fluctuations and symptoms. It is, without a doubt, a real yet treatable condition. As mentioned previously, the baby blues are similar to postpartum depression, but they don’t last as long. Plus, the symptoms are not as severe. If your baby blues are still continuing after more than two weeks, you’re looking at something more serious. You need to speak with your doctor about it. While having postpartum depression is common and not something to be ashamed of, it isn’t the norm after having a baby. If you are having overwhelming symptoms, it is not a normal way to feel, nor is it something you just have to deal with. It is true that the baby blues will clear up on their own. The same thing cannot be said for postpartum depression. If your symptoms are ignored, they will likely get worse. It is imperative you speak with your doctor and not wait for it to clear up on its own. Much like how the symptoms are different for everyone, the recovery can also be different. You will likely have good and bad days, but don’t let a bad day, or a series of bad days, make you feel like you aren’t getting anywhere (source). Your recovery is yours, and it won’t look exactly like anyone else’s. Postpartum depression can set in a few weeks after the baby is born, but it can also manifest later. Some women don’t notice any symptoms until the baby is 6 months old, and some women struggle with the condition when their babies are older. A history of postpartum depression after a previous birth is definitely worth noting. However, there is no guarantee you will have symptoms the second time around (source). It is possible to be severely affected with your first child and not affected at all with the second. The opposite is also true. This is so false it doesn’t even deserve an explanation. Yet, we will give it one anyway. There is a wide range of symptoms that women feel when suffering this condition. Thoughts of harming their baby are one of the more severe symptoms and usually linked to Postpartum psychosis. However, it is by no means one that is felt by every single mother with the condition. Bouts of crying are a common symptom of postpartum depression, but it is not something that affects everyone with the condition. Some women may feel numb, or disinterested in everything. Other women may suffer from bouts of extreme anger. Plus, there is no one symptom that will be completely constant. In fact, you may have moments where you feel great, before the cloud returns. Research has found that some dads have actually been found to have postpartum depression symptoms (source). In fact, 10 percent of new fathers have also experienced the condition. Stay at home dads are particularly at risk (source). Additionally, adoptive parents have been known to suffer from the condition as well. I like the infographic you used in the post. Thank you, Amol! We love making infographics. Feel free to share it with anyone you know might also appreciate it 🙂 And thank you for reading!